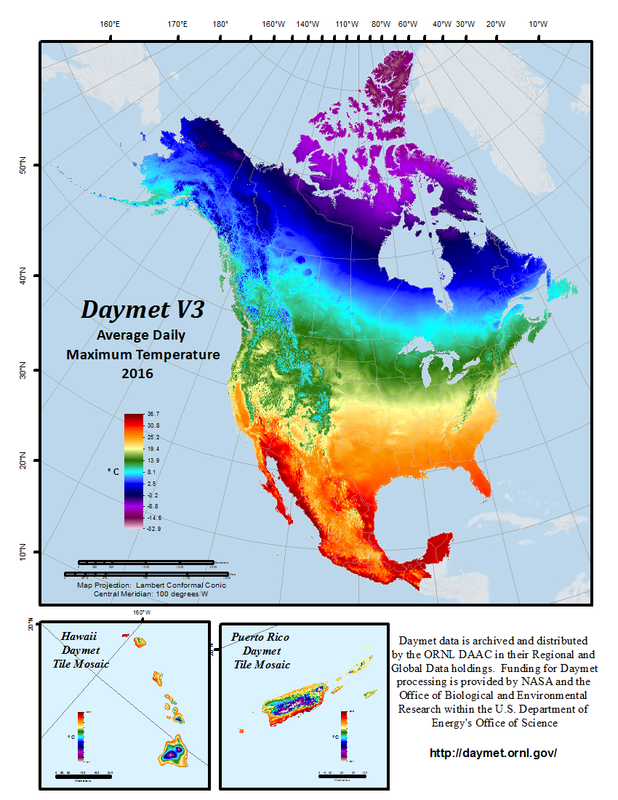 The popular Daymet Version 3 daily surface meteorology data have been updated to include all years 1980 - 2016 for North America, Puerto Rico, and Hawaii. Daymet output variables include the following parameters: minimum temperature, maximum temperature, precipitation, shortwave radiation, vapor pressure, snow water equivalent, and day length. Daymet data are provided as individual files, by variable and year, at a 1-km x 1-km spatial resolution and a daily temporal resolution. Data are in a Lambert Conformal Conic projection for North America and are distributed in a netCDF file (version 1.6) format compliant to Climate and Forecast (CF) metadata conventions. Daymet data are also accessible through a variety of tools and formats listed at https://daymet.ornl.gov. Data authors: Thornton, P.E., M.M. Thornton, B.W. Mayer, Y. Wei, R. Devarakonda, R.S. Vose, and R.B. Cook.